Recently, four of us from Treehouse Software—Mitch Doricich, Mike Kuechenberg, Chris Rudolph and myself—attended Software AG’s TechEd 2015, which took place on April 21-22, 2015 at the Chicago O’Hare Hyatt Regency Hotel. We were joined by over 180 other attendees, including about 60 representing Adabas/Natural sites. The event was organized into separate tracks for Adabas/Natural, webMethods, ARIS and Alfabet, but the morning general sessions were for all attendees. Tim Fortier of Software AG acted as the emcee for the two-day event. There were general presentations and keynotes by various Software AG directors and executives, including Mike Schumpert, Gerd Schneider, Mighael Botha, Cynthia Stegall, Kurt Hansen and Ricardo Leitão, on topics like the Internet of Things (IoT), Software AG’s TECHCommunities, innovation, training and support. Besides the general sessions, the Treehouse team attended the Adabas/Natural breakout sessions. These included presentations by a number of familiar figures from Software AG, including Joe Gentry, Karlheinz Kronauer, Patrick Gould, Eric Wood, Becky Albin and Bruce Beaman, covering Adabas and Natural (and add-on products) roadmaps and futures, and new products and capabilities in the analytics, mobile and integration spaces. Customer presentations were provided by the Geoff Wells and Don Ellis from the State of Minnesota describing tremendous CPU savings using the zIIP Enabler for Natural, and also detailing their early experiences with the new Event Analytics for Adabas, by Amarish Pathak from AAFMAA on integrating Adabas/Natural/EntireX with mobile applications, and by Manny Klonaris from Verizon on Adabas Vista. I found the Event Analytics for Adabas solution to be particularly compelling in today’s world of stringent security, audit and privacy requirements. Becky remarked that it could be called “Event Analytics for Anything”, because the data/events to be analyzed could involve virtually any source. Treehouse TRIM customers could be taking advantage of this solution today for their Adabas data, and analytics based on different data sources could be enabled through other Treehouse products and services. A featured component of the event was Becky giving a Master’s Class on Adabas v8.3. Mike and Chris, the Treehouse technical guys, were logged in to the Treehouse mainframe during the class so that they could follow along on our own system while Becky went through her material. The numerous other DBAs in the room also got great insight into the features and capabilities of this latest Adabas release. In addition, I had the privilege of giving a presentation on behalf of Treehouse, speaking about how Treehouse can help maximize and revitalize Adabas/Natural through our products and services. I want to say a big thanks to Thadd Jenkins from Southwest Airlines, who provided a very gratifying testimonial about the long and mutually-beneficial relationship between Treehouse and Southwest. My presentation is available for download here. TechEd 2015 was hugely beneficial for the attendees to meet and mingle with Software AG experts, management and with other customers. For readers who were unable to make it this year, another TechEd is likely to be scheduled for 2016, based on the roundtable discussion and customer feedback. I encourage all customers to sign up for this free conference. 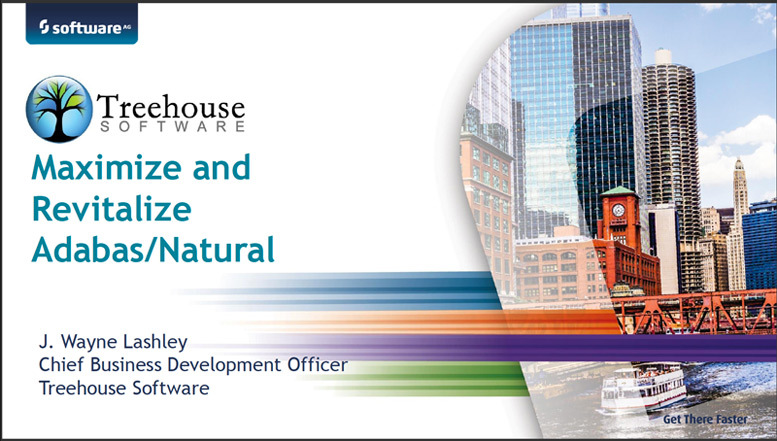 Our thanks to Software AG for organizing a very successful TechEd 2015, and for enabling Treehouse to participate in it. IT Jungle recently posted an interview with Treehouse Software‘s Chief Business Development Officer, Wayne Lashley, where he explains how offering the OpenLegacy solution can now help customers rapidly extract services and information from within their legacy systems into an editable format that can automatically be transformed into stand-alone mobile, web, and cloud applications; and connected with other solutions.